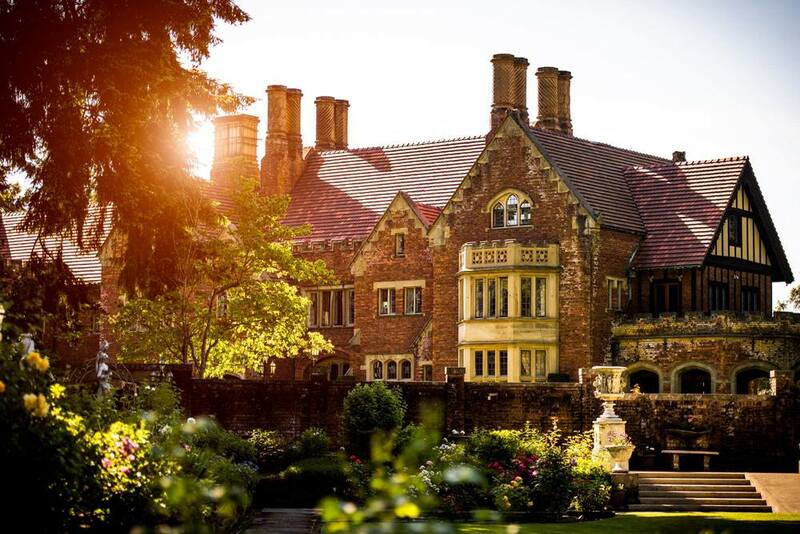 Thornewood Castle is a 500-year-old Tudor Gothic historic site known as “the house that love built.” We’d love to welcome you for an enchanting overnight visit, for your fairy-tale wedding, or other special event. Step back in time – romantic, luxurious suites are available for a special experience filled with old-world elegance. A wedding to remember forever. Beautiful and poetic, this place was made for lovers. Also available for receptions. Host your corporate retreat, parties, family gatherings or other special event at this unique location. Spend your retreat watching sunsets over the lake on our private dock, exploring the famous gardens, & more. As one of the few genuine private castles in the United States, Thornewood is not only a world-class historic site – it's also our home, a magnificent location for Seattle/Tacoma weddings and receptions, and the most romantic bed & breakfast in Washington State. Thornewood Castle is located on the shore of American Lake in Lakewood, WA - 12 miles south of Tacoma and 42 miles south of Seattle in Washington State, USA. Weddings at the Castle are breathtaking. With both outdoor and indoor venue options, stunning scenery, architecture and statuary for photos, and on-site staff to assist you, we love helping couples create their dream wedding. At Thornewood, you can visit a true piece of England without leaving the United States. With a history that is deeply rooted in both English and American history, Thornewood is truly unique. A century ago, pieces from a 400-year-old English castle were shipped around the horn from England to the Pacific Northwest. These pieces were used to completely rebuild and recreate an authentic traditional English Tudor Gothic castle right here in America. From English gardens designed by the Olmsted Brothers to 16th century stained glass windows, Thornewood Castle is rich with history and beauty.